Recently I wrote a post about morning routines, well actually about how frustrated I get with the social media pressure of having the perfect routine from beautiful millennials with no kids and a million loads of laundry piled up begging to be washed (if you missed it you can read it here). 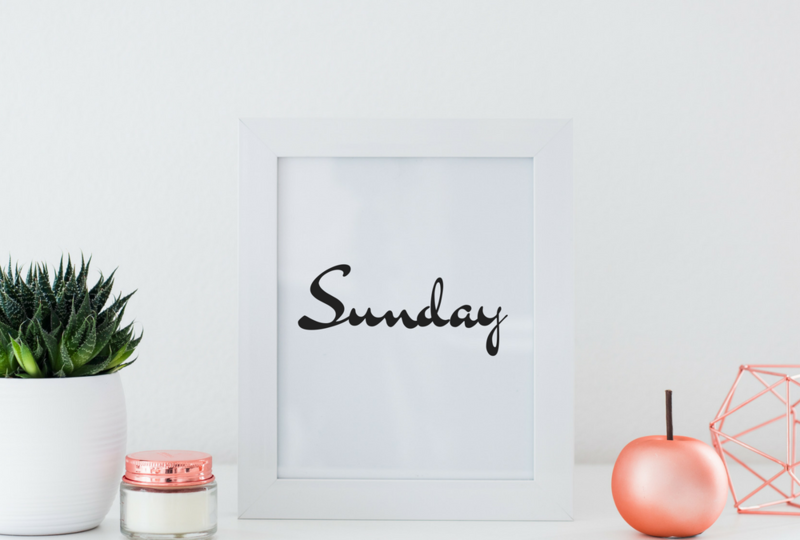 After I wrote that post I stumbled on a new post about the six things you need to do on a Sunday to have a successful week, I was of course intrigued. This list was inspirational and the advice simple, tidy up, check your diary and go to bed early. That kind of practical advice. Now I must admit I am pretty good at keeping things flowing at my house and I run a tight ship. The reason I continue to stumble or hunt whichever way you look at it on these types of articles? I’m always looking for new ways to improve things for everyone in my little family. Often, I find something wonderful and of course, I then implement it and if it works I share it with everyone who is willing to listen, having a blog helps with this! One very important element is missing when we talk about routines and to-do-list. Yes, it’s easy and essential to just cover off what needs to be done. But what about what you should be doing? All the important things that make you happy. That makes it all worthwhile. The things that you are drawn to do. The things you are passionate about. Here are six things to do this Sunday that will make your week less chaotic. They aren’t things like do all the washing, fill your car with petrol and do your meal prep. Those things are important and if they make your week flow better go for it. I just want you to think a little more outside the box. Scheduling things that make you happy, nothing that isn’t going to drain your time or resources. Things that will make your week better because you are more content. Make time to get some sunlight. We need regular sunlight to survive. It boosts our mood and gives us the essential vitamin D we need. Without adequate sunlight, we increase our risk of depression. Next week I am going to cover this topic in more depth, it’s a fascinating read, make sure you’re on the mailing list and it will land in your inbox next Friday morning ♥ But to start things off make a little time this week to get some natural light. Look at your diary and see where you can. You only need a few minutes. Eating lunch outside. Parking the car and walking a bit further. Very easy little stolen moments of sunshine will give you an incredible mood boost. A little space for creativity. I know this sounds very hippy. But it’s not. Human beings love to create. We all have a natural desire to be creative. Thankfully we are all different and this creativity is unique to us all. Making time in your diary on a Sunday to be creative is so important. You don’t need to undertake it on a Sunday if your Sunday’s are like mine and they are spent preparing for the week ahead. But scheduling it in is essential. What are you drawn to do that’s creative? Paint, knit, draw, write, flower arranging, bake, make music, volunteering? We all have something that satisfies our soul. What’s yours? If you don’t know, make the time to find out! Indulging in your creativity is essential for your mental and physical health. You need to make it part of your regular week. Create 7 gratitude notes. Again, I know it’s a touch out there but it’s all too easy to get caught up in what you are working towards and you forget what you already have. Practising gratitude is a muscle that needs exercising every day and it can be hard to get into the groove. It can feel a little awkward at first. But once you get the hang of it, it changes the way you see everything around you. Write seven very simple things you are grateful for. Write them on post-it-notes and pin them to your computer or to the mirror in your bathroom. If you prefer you can add them to your phone and set them as reminders to pop up throughout the day. I guarantee when you read them they will make you appreciate what you have. Choose ten items in your home that you no longer have a need for and get them out of your house. Recycle them, give them to charity, donate them if possible or throw them in the rubbish if there is no way of them being reused. Clutter happens over time. It slowly builds and takes up precious real-estate in your home. Taking ten items over the week keeps the energy flowing. It’s not too difficult to make decisions for only ten items and dispose of them accordingly. You can get the family involved and ask them to pick a few items each. It also acts as a reminder of what we really need and what we are actually using. Make a playlist or a podcast list for the week. If you’re like me and have hundreds of songs on your playlist but spend half of the time skipping songs your not really in the mood for. Take 10 minutes on a Sunday to make a playlist of songs and or podcasts for that week. Tailoring it what you have on and how much time you have. The times that you do get to tune in will be significantly more enjoyable, lifting your mood and making it time well spent. Secret moment. It’s essential to spend time alone. We underestimate its importance because we are animals who thrive in a heard. Everyone’s herd is, of course, is different. But it’s very, very, important to have some time with just yourself and your thoughts. You need time to digest what’s going on around you and how you feel about it. I used to think that I was getting this time when I was driving. That was NOT what was happening. My brain goes a million miles an hour and my train of thought can be relentless. I need time when I am not concentrating on anything else to successfully digest what’s going on in my head. Often just 15 minutes is all you need. A cup of tea and time to process where you are. It’s a gift you can give to yourself that will have a wonderful impact on your wellbeing. The weeks fly by at a ridiculous rate, most of us just scrape by with the time we have. That’s just the way it is. However, it’s possible to squeeze some love, light and happiness in different ways that will have an incredible impact on your wellbeing. If some of these suggestions sound enticing, go for it this week, schedule them in. If they don’t tickle your fancy then think about what will and make it happen. As I always say, life is an incredible journey and we only get one go, don’t let it slip away without making the most of it. Love SIX THINGS TO DO THIS SUNDAY TO MAKE YOUR WEEK LESS CHAOTIC? Or know someone who needs to read this? Please share away!